PFP Holiday Party and Fundraiser: "The Santa Cause"
We are excited to announce that PFP is partnering with the incredible Make-a-Wish of Eastern NC Foundation for our annual fundraiser and holiday party. PFP has committed to funding 1 Wish through proceeds of the event along with donating a portion of additional proceeds to Make-a-Wish of Eastern NC from this event. Wishes strengthen kids and their families, rally communities together, and change the lives of everyone involved. Tickets for the event are now on sale on our website or through the link below and include live music, 3 course meal, beer and wine. Ticket holders will also get access to an exclusive raffle, silent auction, and Live High-Rollers Auction during the event. On August 16th, we held another pop-up networking event at Hutchins Garage in Durham. We had a great turn out with plenty of new faces to accompany our existing members. 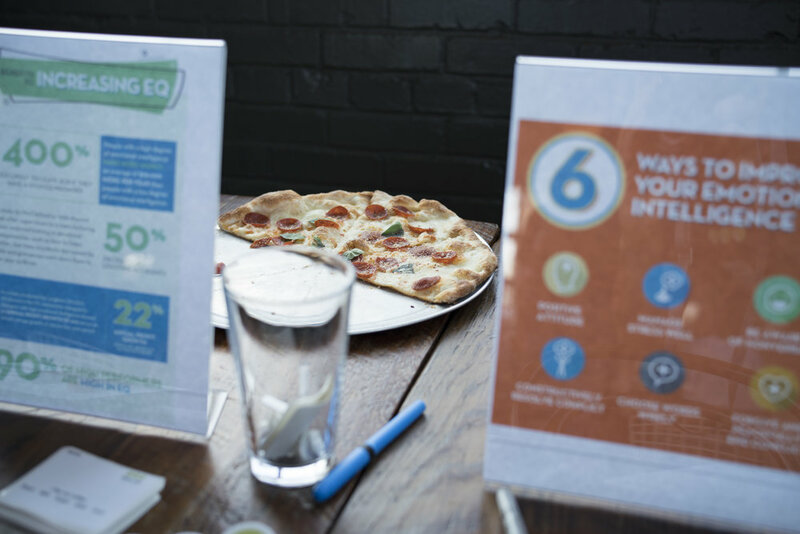 Aside from sharing the great beer and pizza, our leaders shared with attendees lessons and tips on EQ. This event's focus was based on how to leverage breathing to improve your self-management. For those of you unable to attend, we have included these tips below! Ever struggle controlling your emotions or stress levels, especially in heated or testing conversations? Did you know that you brain demands 20 percent of your body's oxygen? It uses oxygen to control both basic functions, like breathing and sight as well as complex functions, such as thinking and managing your mood. What's interesting is that your brain dedicates oxygen to the basic functions, makes sense; they keep you alive! Whatever oxygen remains, is then used for complex functions; keeping you focused and in control. Shallow breaths deprive your brain of oxygen and yet like most people, you probably take shallow breaths 99.9% of the time you aren't thinking about breathing. The next time you are in a stressful situation, use slow, deep breaths; "in through the nose, out through the mouth." With practice, this technique can be done in the presence of others without them being aware. ANYTIME you choose to take full breaths and overflow your brain with oxygen, you'll notice the benefits instantly. Most describe this effect as being calm, clear, and relaxed. This effect makes proper breathing one of the easiest ways to manage your emotions in difficult situations. So, start practicing at your desk, in front of the mirror, on breaks, whatever works. But next time you are in that difficult social situation or uncomfortable conversation or facing that looming deadline, try taking a breath. It might sound too simple, but this is one of the easiest, proven ways to power your rational brain and increase your social competence and relationship management skills as part of your full emotional intelligence. "Start with Why" influences people to become more inspired at work, and in turn, inspire their peers. Sinek starts with a fundamental question that shows how the world's most influential leaders all think, act and communicate in the same way, and how its different from what everyone else does. This concept is called the Golden Circle and it provides a framework for how organizations can be built, movements can be led, and how people can be inspired. If you want to read more about the ideas that inspired one of the most popular TED Talks of all time, check out "Start with Why". Ever wonder where the term “Emotional Intelligence” came from? The article below by ABC News is an interesting read on how key psychologists Reuven Bar-On, John Mayer, and Peter Salovey developed the idea and terminology we know today. The article also explains the five areas and 15 subsections and scales that Bar-On used to develop the EQ-I. Check out the article for yourself and see what traits you are strong in!